In the midst of hectic work schedule, I managed to pull off a two day total road trip in Mumbai. And yes it was not possible to cover whole Mumbai , I covered only Navi Mumbai. 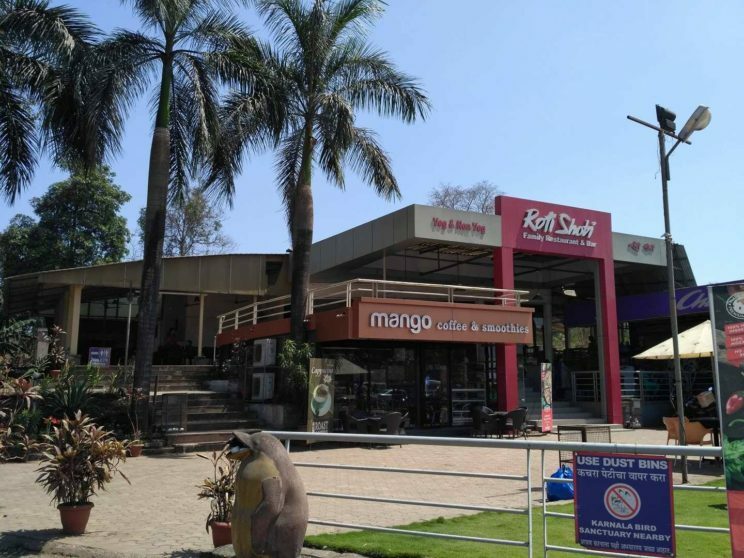 Mumbai, the city of Dreams, has always been a dream for me to explore and when I got a sudden invitation from my friend in Vashi, in the midst of summer though it was not a very pleasant season for a road trip, it seemed a good escape from daily life. Before the journey we had made a rough plan of the route in five minutes, and kick started with Beth el Synagogue. My journey started from Vashi, from where we came to Panvel did some repair work on our vehicle. And after 10 minutes of search we got to know about the place. And we ran into police. Such a great start of the trip !! There was an armed team of 5-6 police officers who started questioning us about our identity and purpose of visit. 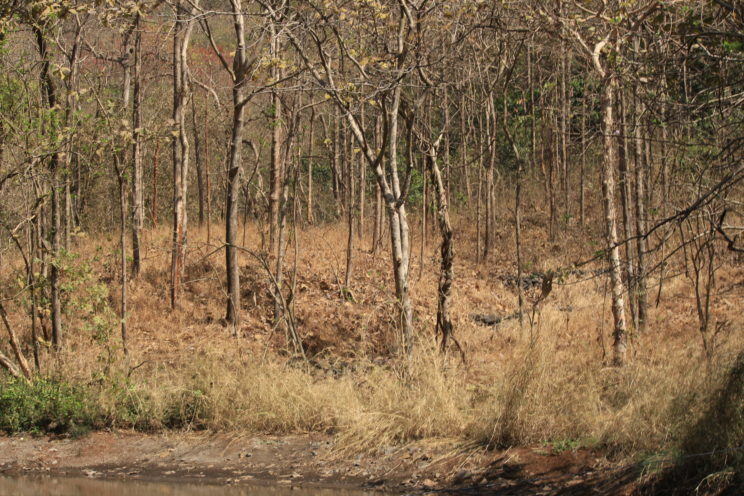 We came to know it’s a very sensitive place and without proper permissions you cannot visit the place. Also the entrance of the place is very small and hiding in the street so you should ask the local people about ‘foreign mandir’ or ‘Syanog’ ( Synagogue ). Unfortunately we didn’t have any permissions or any prior knowledge of having permit so we couldn’t enter the place but some information that I have gathered after talking to the people I met outside goes here. Around 20 Bene-Israeli families lives here in this Jewish house of prayer situated at the heart of Old Panvel, Navi Mumbai. It has been there from 1849 and from the starting it has been arranging prayers for three time every day. The first day is said to be Arbith which means the inception and it starts at evening and the last being said as Sabbath which means day of rest. For female visitors there is a different entry point. Then we headed towards Karnala Fort and Bird Sanctuary. Karnala fort is a hill fort in Raigad district about 10 km from Panvel city. We took some ticket and went for the sanctuary; then after some moments of bird watching and clicking random photos,we entered the jungle in search of adventure . It’s very solitary place maybe that time was not the season for the trek ( start of summer ) and no mobile network was there . Anyway we walked up the hill and soon we got a great place full of rocks and dry trees. 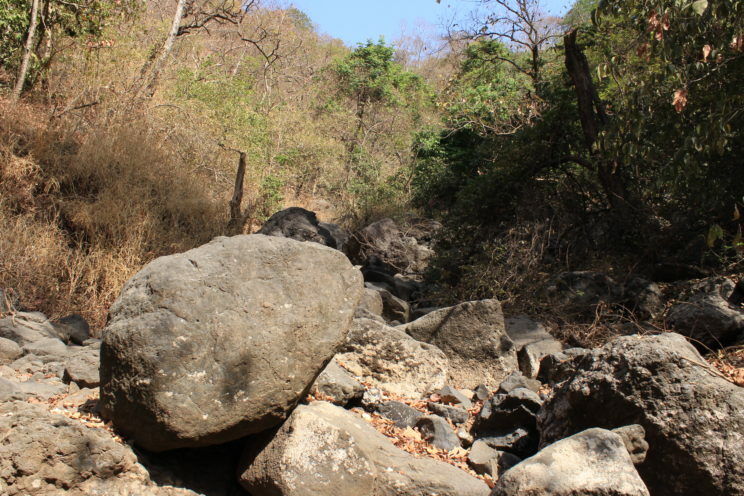 We started to go upwards, it seemed that wasn’t a regular trekking route as we were approaching upside, full of thorns. After a certain point it was impossible to go up because after 600-700 meters of totally stiff trekking what we found out before us is a big rock surrounded by prickwoods and the ground was full of loose rocks. So we stopped and started climbing down, that was one of the most difficult tasks as the route was so stiff that every moment you have the fear and feel of slipping down. And suddenly one dry tree broke , the tree that we were holding and we were kind of free falling through thorns, somehow we managed to hold to something and saved ourselves from the bone shattering fall. We managed to get to the ground finally and heaving a sigh of relief only to find out that we have been lost and the point we have started from isn’t the place we are now in. 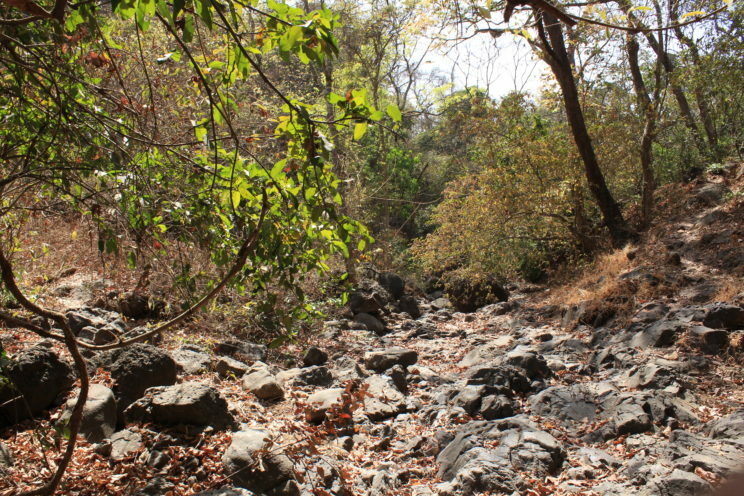 What could be done rather than walking towards finding the way out and on doing so we came across a dry river through which we were going and each time we were crossing small boulders we thought we are reaching the end of the jungle. Suddenly we realized that we are just doing circular strolling. My friend started some spooky fantasies like some evil might be doing this to eat us, it was already evening and the jungle was pretty dense so the environment became really bone chilling with the occasional eerie sounds from some random birds like a mixture of hoarse or grating coos. However we kept our cool and started to follow the fading sounds of cars or horns of trucks which wasn’t very much positive way but suddenly we found out a person who was there in search of people who are lost , he also told that in past there were some murder incidents happened which led the authority to keep people like him to watch out. It’s advisable that you should reach before 2pm otherwise the fort path will be closed and 6 pm is the time by when everyone should return. The place is good and not very much crowded, the trekking takes 1 and half to two hours to reach top of the hill where the fort is.One must take water and some dry food while going up here as in the 2 hours path there won’t be any small shop. After Karla while returning we had a decent lunch at the Mango. There was a petrol pump too which is very handy for getting some extra fuel. Then we headed towards the streets of the town, where I had the best Faluda 😀 . In a local small roadside shop which is very famous there. 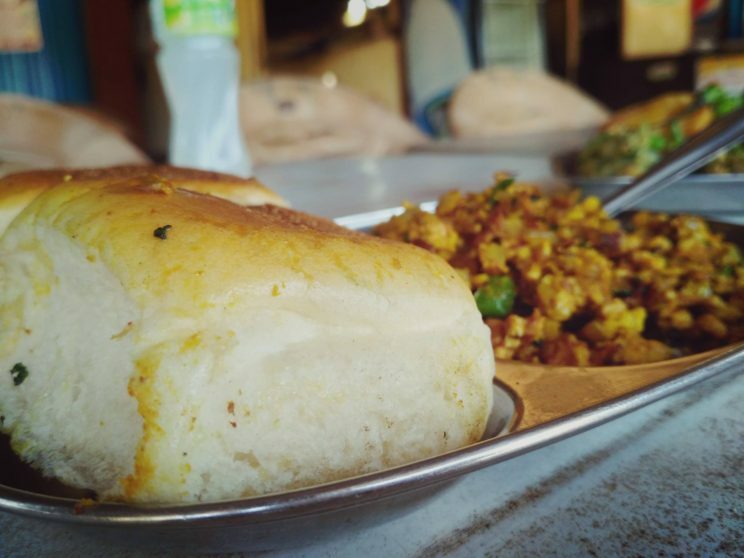 And then when in Mumbai who can forget the essence of Vada Pav, Pav bhaji and Pakodi Pav , I tasted all, those are awesome, Mumbai is famous for this and yes it lived up to my expectations. While returning there was the Dy Patil Stadium at the left , couldn’t see much of it as it was already dark and we had to move fast through the traffic. Sure @rajat. Hope You are doing great and stay tuned to us.